Seventy-five years after Gene Krupa became a household name, his version of Sing, Sing, Sing remains one of the most recognizable patterns in the history of the drum kit. If you don’t believe me, play the beat for anyone 3 to 93 years old. They all know it, though younger people often relate it to a movie or TV commercial (and not Gene Krupa). Why has this much imitated and borrowed groove connected with so many people throughout the years and had such a powerful effect? Hopefully, this article/lesson might answer that question and provide you with some fun swung-eighth (and eighth-note triplet) patterns, so that you create your own masterpiece. Note: Patterns 1-6 below use swung eighth notes, while 7 and 8 use eighth-note triplets. If you are not familiar with these rhythms and would like more information, I would recommend my new book though Hal Leonard, Drumcraft. If you would like to see the full four-bar transcription of Krupa’s Sing, Sing, Sing groove, you can find this in my book Drum Aerobics. First, here is the sheet music for this lesson. Pattern #1 is derived from the intro of the version below. Though this is actually not Gene Krupa on drums, his influence is obvious here. It’s also included because the intro pattern is fairly easy to execute (alternating swung eighth notes with accents), and the track has a clean sound, providing for a good play-along. I believe that the marching tempo, four-on-the-floor bass drum, 2 and 4 hi-hat, and accented floor tom riff (most probably borrowed from New Orleans drummers of that time), provide just the right amount of danceability and low-end contrast to the mids and highs of the horn parts. 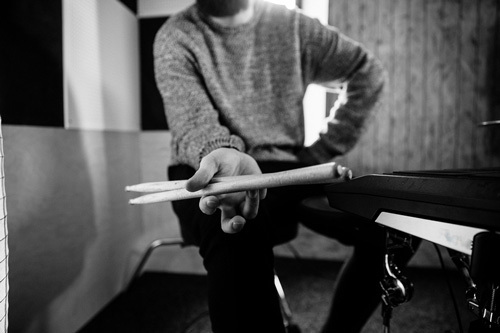 Tip: Make sure that the accented floor tom notes are heard well above the unaccented notes. Attempt to place the bass drum quarters dynamically below the floor tom eighths. Pattern # 2 is transcribed from the following version. As you can see (and hear), this is Gene Krupa on drums. 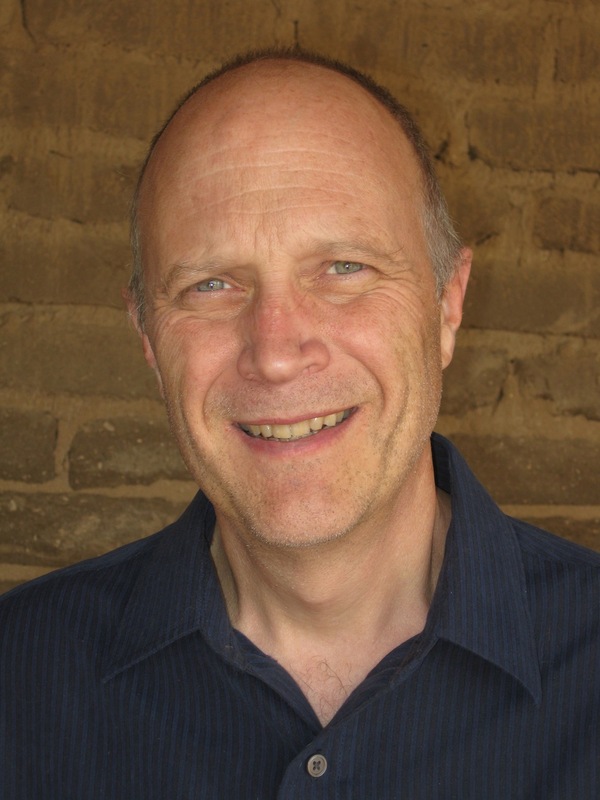 Gene played in an improvisational style, full of dynamics and musical decision-making. Pattern #2 is a great starting point, but if you really want to play this groove more like Gene, it will require you to gain a great deal of facility. Notice how Krupa cleverly uses space (combinations of quarter and eighths) and a few double strokes (including one inverted paradiddle) to change the phrasing. Patterns #3 and #4 use alternate sticking, and the left hand moves from the floor tom to the high tom and back. Pattern #5 uses a R L L sticking to create a nice drum melody. 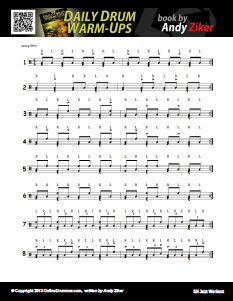 Pattern #6 borrows from New Orleans greats Johnny Vidacovich and Stanton Moore and their R R L R R L R L sticking. Pattern #7 introduces eighth note triplets (which Krupa often used in Sing, Sing, Sing) and incorporates the visually stimulating skill of cross-sticking. Pattern #8 uses a displaced six-stroke roll with accents. You will be better off if you devote some of your time looking to the past to help inspire your future success. However, I can’t guarantee that you or anyone else will ever reach Gene Krupa’s iconic status. 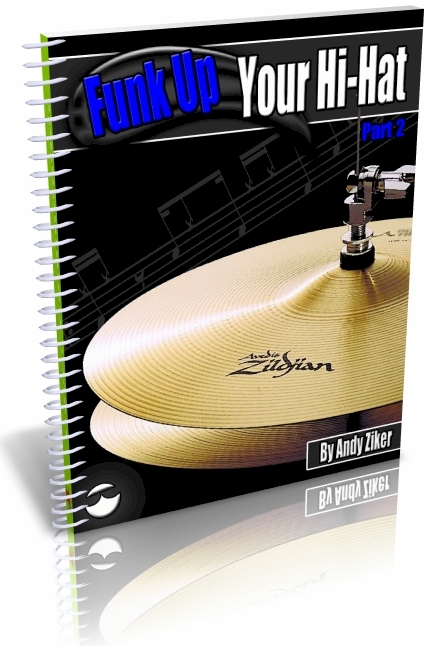 Funk Up Your Hi-Hat Part 2 is now available in the OnlineDrummer Store (along with Part 1). Part 2 provides you additional practice with the grooves in Part 1 (review is a powerful tool) and applies these patterns in two-measure phrases. Here is an example.